Thinking about the inevitability of our own death is not something that we like to do, nevertheless, dying is a fact of life. We all have to accept that our lives will end one day. With no way of knowing how or when this will occur, it is easy to push death to the back of our minds. This is why many people don’t get around to making a will. Unfortunately, dying without a will can have serious consequences for loved ones left behind. This week, Lean on Me author Lorraine Kember and I team up to share our experiences and explain that preparing a will really means giving yourself and your loved ones peace of mind. When Lorraine’s husband, Brian, was diagnosed with mesothelioma, Professor Bruce Robinson told him to hope for the best and prepare for the worst. This was sound advice, and it’s exactly what Brian did. “Although Brian and I had both written wills many years before Brian was diagnosed with mesothelioma, they did need to be brought up to date. After we had attended to this, we filed them away, and did not think of them again. I will always be grateful that Brian had a will when he passed away. I was asked to present this on so many occasions when putting my affairs in order. The sound advice given by Professor Robinson, in regard to preparing for the worst, should not be heeded only by those who are aged or suffering from an incurable illness. My mom, Lena, decided to prepare her will after she was diagnosed with a cancer possibly caused by asbestos exposure. When Lena died the following year, she appreciated the peace of mind of having her will in order. Losing my mom was extremely difficult, but knowing that she had documented her wishes made things easier for my dad and me. I’m glad we were able to spend our final weeks being with her, and making her comfortable, rather than scurrying to settle her affairs. In fact, I would say that losing peace of mind is the biggest hazard of not having a will. That’s because I’ve seen the alternative. People who wait until death is eminent to prepare a will suffer extreme distress. Families panic when they realize they don’t know their loved ones’ wishes. Meanwhile, their loved one is losing or has already lost the ability to communicate those wishes. And if a person has lost their mental capacity, it’s too late to make a will. There’s no valid will without capacity. 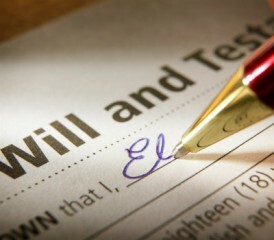 If someone dies without a valid will, the court distributes their property according to state law. These laws, known as the laws of intestate succession, list the priority in which property is distributed after death. State laws also list the priority for picking the person who will administer someone’s estate. But the deceased person may have had different priorities. If you want to leave certain property to certain people, known as making a bequest, you’re best off making a will in advance. In all the wills I’ve seen, I’ve never come across anyone whose wishes exactly matched the laws of intestate succession. I’d like to add that once it’s written, you should consider reviewing it periodically. That’s what Lorraine and her husband did to see if it needed updating. For those worried about the costs of preparing a will, you may be surprised by the availability of free and low cost options. In my career, I’ve volunteered to help people prepare wills and other end-of-life documents. I’ve done this through free legal clinics sponsored by churches, bar associations and organizations like the AARP. In addition to these options, you could ask the patient services departments at any hospitals or other medical providers for a list of possible resources for free or low-cost legal help. Instead, I tested a popular brand of will preparation software for her. It seemed to ask the appropriate questions for her situation. So I sat with her as she did it, and explained any legal terms she didn’t understand. But even though I had vetted the software beforehand, I still thought it missed some things she wanted. I then asked a colleague, who was licensed in her state, to help her clean up the final product. I always tell people that if they’re going to use the software, at least try to see if you can get a lawyer to look at the final product before you execute it. Depending on the complexity of your estate and accuracy of your software, you might be able to save a little on legal fees. My dad hired a lawyer to write his will when I was a little girl. He went back to the same attorney after my mom died to have it updated. The lawyer only charged him a modest fee. I think that’s the ideal situation: Invest a little up front, and then have a family lawyer you can return to when your life circumstances inevitably change. I also caution people that while wills are the most well-known legal instruments for documenting final wishes, they’re not necessarily the only document you’ll need. Not all of your assets can be passed by a will. Life insurance proceeds, property held in trusts, payable-on-death bank accounts, and retirement plans are a few examples. It’s also a good idea to prepare a separate document with your wishes for funeral arrangements. You can certainly include those things in a will if you want, but the problem is that wills aren’t usually read until a few days or weeks after death. It’s nice for loved ones to have something handy to guide decisions about memorial services, funerals and burials. I clutched my mom’s list during the days between her death and her funeral. Her will was never far out of reach during the months when I was administering her estate. It was like she was there holding my hand, guiding me along to way to make sure everything was done the way wanted. If you haven’t written a will as yet, why not write one now? Consider making arrangements today to give your loved ones the same gift Brian and Lena gave Lorraine and Karen.